I read this article and found it very interesting, thought it might be something for you. The article is called An Announcement & Review of The Recipe Girl Cookbook and is located at https://www.anediblemosaic.com/an-announcement-the-recipe-girl-cookbook-review/. I have an exciting announcement today…I’m now a contributor to Recipe Girl’s other food blog, Culinary Covers! Lori has an incredibly talented bunch of contributors over there, and I’m honored to be included. The premise of Culinary Covers is to make and review cover recipes from food magazines and cookbooks to determine whether they are really cover-worthy; because we all know that although some cover recipes look insanely delicious, there are times when they turn out to be not-so-much worth the effort, let alone worthy of the coveted cover spot. It’s such a fun idea! Let me preface this with the fact that before this cake, I’ve never made an upside-down cake in my life. Pineapple Upside-Down cake isn’t a favorite of mine, and other than tasting that, I have never made any other forays into the world of upside-down cakes. However, while thumbing through Lori’s book, the title of this one immediately grabbed my attention; the combo of browned butter and banana was something I could totally get on board with. Having never made a cake like this before, I was pleasantly surprised at how fast and easy it was to put together. Lori’s directions were spot-on and easy to follow, which is something I always love about the recipes on her website as well. The most time-consuming part of putting this cake together was browning the butter – but even that only takes about 5 minutes! Plus browning butter is easy to tend to, requiring only to be stirred, and it’s well-worth the effort in the end. Salmon is a big part of mine and Mike’s meals, so I’m always on the lookout for new ways to make it. This recipe, which is full of bold flavors like soy sauce, Dijon mustard, and garlic, sounded delicious and pulled me in when I saw that it comes together very quickly and easily, making it perfect for a weeknight meal. It was every bit as delicious as I thought it would be, and wonderful paired with a simple salad of mixed greens with navel oranges, white onion, and dried cranberries. The recipe recommends serving the salmon with fresh lime to squeeze on top; I forgot the lime in my picture, but I added it when I ate it, and I definitely recommend lime as the perfect finishing touch! These mini muffins were really fun to make and eat. Sort-of like being at a ball game, only minus the deep-fried aspect and minus the boredom that goes along with baseball (sorry baseball fans, but I’m always ready to go before the seventh-inning stretch…I’m more of a hockey girl!). My nine-year-old niece Autumn Rose was thumbing through Lori’s cookbook when she spotted them and immediately asked if we could make them. Corn dogs are one of her favorite treats at baseball games – I think she looks forward to going to baseball games just so she can get a corn dog! Autumn had just indulged me in having cabbage and white bean soup for breakfast, and since she’s always willing to try whatever new food I put in front of her, I agreed to her request right away. Served with ketchup for her and stone-ground mustard for me, we both loved these. A bit of sharp cheddar is the perfect addition, and they really do taste like a healthier version of a corn dog. We used Hebrew National hot dogs because that’s what was in my freezer (they’re my go-to for hot dogs), but next time I make these muffins I might try them with organic hot dogs from Applegate Farms, which I also really enjoy (Applegate Farms offers organic turkey, chicken, and beef varieties, which is great because we don’t eat pork). I spotted this recipe around lunchtime one day; being immediately smitten, I didn’t want to wait to make it until I had gone to the store, so I decided to use what I had on hand for my own adaptation. I used kale instead of Swiss chard, white onion instead of shallot, and shaved parmesan instead of crumbled feta – only because that’s what I had on hand. I loved this recipe and I will definitely be trying the original version as well. It was fantastic, very flavorful and bright because of the touch of lemon that’s added at the end. It would be the perfect side dish for just about any meal, but it’s also a perfectly satisfying lunch, yielding about 3 lunch-sized servings instead of 6 side dish-sized servings. Yup, this is every bit as amazing as it sounds. That’s all I’m going to say about it here! For the full recipe for Recipe Girl’s Macaroni and Cheese Soup with Roasted Cherry Tomatoes and my review, head over to my post on Culinary Covers. I will say this though: if you buy The Recipe Girl Cookbook, Lori’s beautiful recipes are sure to become favorites in your kitchen! There are still so many things I still want to make from this book, like Cheesecake Hot Chocolate, Cinnamon Roll Pancakes, Chopped Chicken and Couscous Salad with Sweet Basil Dressing, Buffalo Chicken Wraps, Hot Seafood Dip in a Bread Bowl, Triple Berry Salad with Sugared Almonds, and Shrimp and Cashew Stir-Fry with Udon Noodles, to name just a few. I can see myself reaching for this book often. Disclosure: I received a free review copy of The Recipe Girl Cookbook (Houghton Mifflin Harcourt; April 2013); as always, opinions are my own. This post contains Amazon affiliate links to products I believe in, which means that even though it doesn’t cost you anything extra, I will receive a small amount of money from the sale of these items, which helps me keep this site alive – thank you for helping to support An Edible Mosaic! An interesting sounding book. Lovely food and clicks! All of these recipes sound so good and a lot of them are really fun. Mac and cheese soup? ohmygosh! I adore banana desserts. Congrats on being a contributor! Nice variety of foods. The corn dog muffins are so cute, my nephews would love those. Culinary Covers sounds interesting, I wonder how many recipes won’t make the cut. Congrats on being part of that project. What a fun new project, I love the upside down cake! I can’t wait to get my little paws on that book! Wow! So impressed on all of the different recipes you made. I’m posting about the Garlicky Swiss Chard and Chickpeas on Thursday, it was so good and I love your adaptation. So glad Lori pointed me in your blog’s direction, look forward to following you! Congratulations on your cookbook! Love your blog and I’m sure your cookbook is just as great! Susan, Thank you so much for your sweet comment! The Recipe Girl Cookbook is my friend Lori’s cookbook; she blogs at RecipeGirl.com. Her cookbook is a real beauty! 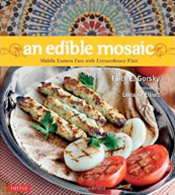 My cookbook is called An Edible Mosaic: Middle Eastern Fare with Extraordinary Flair; I talk more about it here if you’re interested.